It is not that other autopilots are unsafe, but the EZ Pilot products, an autopilot and an altitude select/hold servo (two independent units) are both designed with key safety features that are not typically seen on autopilots. For example, the EZ Pilot autopilot and altitude hold have unique auto-disengage features that prevent pilots from accidentally taking off with the autopilot engaged. The EZ Hold has an accelerometer built into it that automatically disconnects the altitude hold if it senses excessive G forces (such as severe turbulence). This could save you from bending your airframe. Once minimum climb and maximum descent speeds have been programmed into the trademarked “smart servo” the EZ Hold will adjust the pitch of the aircraft during climbs or descents to stay within these parameters, preventing accidental stalls or overspeed descents. You can climb using rate or airspeed as a constant, all with one button and one knob to select your choices. 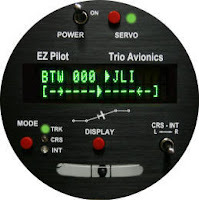 The EZ Pilot autopilot shares the same smart servo technology, which monit ors the autopilot system on a two-way circuit every 100 microseconds and responds with adjustments. If you push on the stick, the servo’s clutch eliminates feedback through the stick. The autopilot is easily interfaced with most GPSes for tracking, and also has its own track, cross track, return-to-track and even a handy offset track function to let you fly slightly off the center of an airway (to avoid traffic). It’s 180° turn function can be called up with just a push of a button even if the autopilot is off. A VFR pilot who finds himself suddenly in IMC can push one button for 5 seconds and the autopilot will engage, level the wings, and then begin a standard-rate 180° turn that should take the errant pilot back to VFR conditions. It also works for IFR pilots who just need to track and turn 180° in a holding pattern. Dr. Sid Tolchin, a retired neurosurgeon from El Cajon, California, hints that a complete three-axis autopilot that will retail for somewhere in the $4000 range is in the company’s future. Watch for it.